The AIS black box is a simple to use low cost introduction to using AIS. Will work with most AIS compatible software or hardware including seaPro standard and above. Requires an external VHF marine antenna (use of a sharing switch is not recommended). Connects via the supplied RS232NMEA183 connector to a PC and a 12v power connector (standard 12 v battery supply). Note:The engine is a single channel receiver that automatically switches between the two fixed frequency AIS channels. 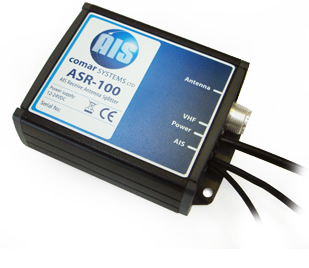 The R200U AIS Receiver is a true Dual Channel (Parallel) AIS Receiver. 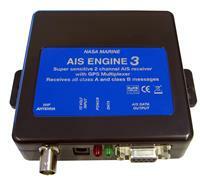 It has two AIS receivers monitoring both AIS channels at the same time and decoding both channels simultaneously. Unlike some other AIS receivers that claim to be dual channel, the R200U is a true parallel AIS receiver, ensuring that you receive the most up to date positions and information of all vessels around you. The unit has the option of connecting directly to your PC via a USB cable for both data and power or using the standard NMEA 0183 serial output, so is compatible with most AIS aware equipment. Similarly it can be powered either from the USB or from an external 12/24v DC supply (ships batteries). The AIS-3R installation using the USB connection is quick and easy, requiring only the connection to a VHF antenna, connection to your PC via a supplied USB cable, and the instalation of the driver software. Enables easy installation of an AIS receiver by splitting the VHF radio antenna so that when the VHF radio is receiving the AIS also receives a split signal from the antenna. When the VHF radio transmits the signal is blocked. Note avilability of this item is resticted - please call sales. AI3000 is a profesional , high performance true dual channel AIS receive unit, that enables the reception of AIS information from suitably equipped vessels at a fraction of the cost of a conventional AIS transponder.